Steiner in the studio at Baltimore’s WEAA. Five years later, Steiner still is, but after nearly a quarter of a century on the air, he will sign off at the end of July. His eponymous public affairs show on Morgan State University’s WEAA is the third iteration of the program over three different stations, one of which he helped to found. Through his show and career, Steiner has become a local institution and an instructive outlier in public broadcasting. This latest turn in Steiner’s career provides an opportunity to reflect on the evolution of local public radio over the last generation and to consider coming changes. Steiner told me the Ira Glass anecdote with a mixture of pride and ruefulness. At 71 he is equal parts tired and energized by this latest transition. In an era in which public radio boasts about its “curatorial” services to well-heeled, highly educated listeners, Steiner’s approach to radio comes straight out of the community radio ethos: Democracy, diversity and critique trump chill professionalism and Apollonian restraint. 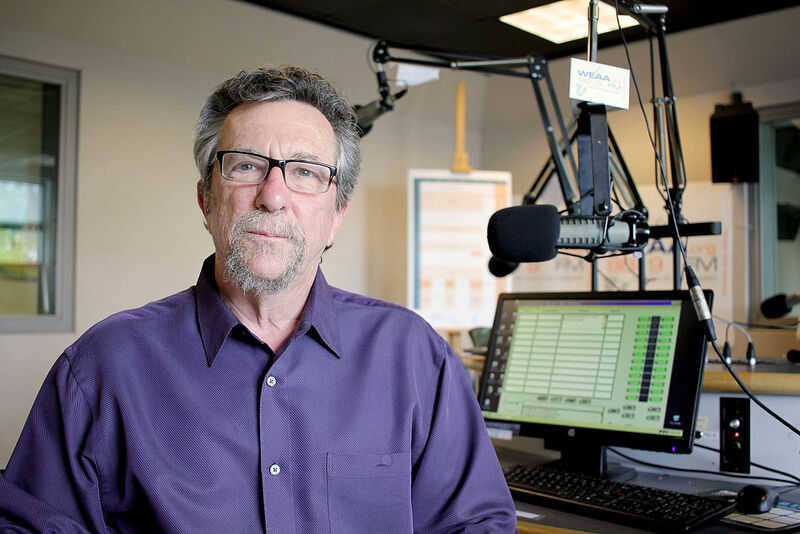 Steiner’s on-air voice — scratchy, prone to genuine guffaws and the occasional skipped syllable or two when he’s thinking faster than he can articulate — also stands apart from the crisp, clear soundscape of modern public radio. More than anything else, Steiner’s career has been dedicated to dismantling the racial divides that structure Baltimore and its airwaves. He leaves those airwaves at a parlous moment in race relations in the city and nationwide. Steiner’s career “represents a counter-story” to the dominant narrative of public radio’s recent history, says Stefanie Mavronis, a former producer for Steiner. Former senior producer Mark Gunnery agrees, calling Steiner “an odd duck” in the local and national public media space. Steiner’s voice and career have provided resonant commentary on the dominant sound of modern public radio, reverberating older modes of community radio and evoking a possible future for public media. Yet as many of his most devoted listeners would say, it isn’t about Marc; it’s about “participatory democracy” and “public ownership of the airwaves.” Powerful ideas about the role of public discourse and community media have coalesced around Steiner’s radio shows over the years, through good times and bad. The future of those ideas, like Steiner’s next move and the American experiment in publicly funded radio, remain uncertain. Steiner grew up white and Jewish in black Baltimore, the son of parents who embraced the ideal of integration in a very segregated city. At 11 years old, Steiner integrated his otherwise all-black Boy Scout troop. A one-time “teenage Trotskyist,” an antiwar and civil rights activist, he was arrested and kicked out of school for his civil rights activism and beaten by police for protesting the Vietnam War as part of Students for a Democratic Society. As a young man, Steiner became a youth counselor and educator who taught theater in prisons. He later taught at the renowned Baltimore School for the Arts and served as principal of the Baltimore Experimental High School. He tried his hand at marketing research and running political campaigns for local Democrats before coming to radio rather late in his career. It became clear that the central conflict between listeners and station management was over who “owns” public radio. The show also included features common to mainstream public affairs programs on the local and national level. Steiner regularly spoke with local media critics and covered arts and culture. In 2002 he began hosting the “Annapolis Summit” broadcast, which kicked off the start of each year’s legislative session and included an interview with the governor. New arrivals to Baltimore, like former City Paper editor Karen Houppert, said Steiner’s show helped give them “the lay of the land.” David Simon, creator of The Wire, called Steiner “an essential civic asset.” The show became an important cultural and political touchstone for life in the city during a decade in which soaring crime rates, rampant drug addiction and corrupt policing inspired Homicide: Life on the Street, The Corner, The Wire and rapid population decline. I first tuned in to Steiner’s WJHU program during coverage of a heated three-way mayoral election in 1999 that resulted in Martin O’Malley’s surprising victory. The coverage included in-depth, one-on-one interviews with the three leading candidates. I have been a guest on Steiner’s program several times over the years, and have interviewed him on several occasions for a research project on the history of public radio. Like many colleges and universities with public radio stations at the dawn of the digital broadcasting era, Hopkins decided in 2001 to sell WJHU rather than pay for expensive equipment upgrades. Bidders for the station included industry behemoths Minnesota Public Radio, WGBH in Boston and WAMU in Washington, D.C. In 2002 Steiner put together a group of local investors to buy the station and reconfigure it as WYPR, a plan which almost faltered before commercial broadcasting tycoon Anthony Brandon fatefully stepped in with the necessary money. Brandon, president and CEO, and Steiner, executive vice president, almost immediately clashed over the approach the station should take. Over the next six years, a grim war of position ensued as Steiner fought for journalistic independence while Brandon slowly pushed Steiner out of the station’s governance. During this period Steiner focused more on his own show and less on station governance. He also started a nonprofit, the Center for Emerging Media, which produced independent programs and raised its own funds. 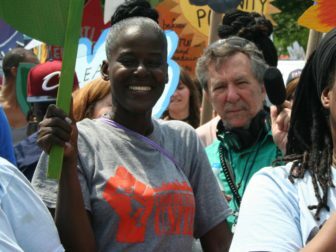 Projects like Just Words, an audio documentary that aired on WYPR, featured the voices and the perspectives of socially and economically marginalized people. Just Words won a Peabody Award in 2007. The great irony — Steiner called it “poetic justice” — is that Steiner won the Peabody only a few weeks after being unceremoniously sacked by Brandon in February 2008. In retrospect, the firing of Steiner seems an unsurprising conclusion after his removal from the station’s governance and his growing reliance on an independent production company for financial support and creative independence. But at the time it sent shockwaves throughout the city and public media. It seemed, almost immediately, to stand for something larger: a collapse of a previous compact between public media and their publics, and the betrayal of a community of listeners who had come to see WYPR and Steiner as inextricably linked. The response from loyal listeners of The Marc Steiner Show was swift and merciless. “No Marc=No Money” bumper stickers appeared around town. A small but dedicated group of listeners formed a picket line outside the station’s studio. The station’s previously obscure Community Advisory Board peremptorily met and called for a public meeting, at which irate listeners could address their grievances to WYPR management. I attended the gathering that ensued, held in the Meyerhoff Auditorium at the Baltimore Museum of Art. It was impressive in both its size (over 300 people) and its passion. Radio’s audience — always invisible, usually silent — was suddenly neither. Dozens of outraged listeners took to the open microphones to condemn the decision and call for Steiner’s reinstatement. Many listeners were quick to clarify that “this isn’t about Marc” so much as it was about the larger principles of how public radio should operate. It became clear that the central conflict between listeners and station management was over who “owns” public radio. “Our funds pay one-third of WYPR’s budget, so we should have one-third representation on the board,” insisted a woman named Helen. Another listener, Dana, insisted that she was “an owner” of the station. “I’m the public in public radio,” said Ruth. Several others were quick to remind station management that WYPR’s call letters stand for “Your Public Radio” and that on-air hosts made sure to emphasize the “Your” in frequent station identifications and pledge drives. The slogan now “rings hollow,” according to Fred Van Dyk, another unhappy listener. Even so, the promise of ownership emboldened Van Dyk to demand “racial, financial, political and geographic diversity” on the station board. Brandon had a point, as subsequent Arbitron reports would bear out, but the crowd that rose up in protest of Steiner’s firing represented something larger than a single radio host or a single radio station. The visibility and audibility of radio listeners, brought together in one place to talk about the importance of public radio, struck some as a kind of a revelation. Brandon and the WYPR board responded to the calls to reinstate Steiner, or at least to justify his firing, in subsequent public statements with a list of plausible talking points. Sagging ratings were the main culprit used to justify the firing, but the Baltimore Sun reported that the ratings dip was across the station’s entire lineup, not just during Steiner’s program. Steiner records audio among a group of protesters from Baltimore at the 2017 People’s Climate March in Washington, D.C. Program manager Andy Bienstock told me on the Monday after Steiner was fired that he thought the show “had become tired.” Elsewhere, station management suggested that Steiner’s Baltimore-centric focus ran counter to the station’s mission to reach the entire state of Maryland in signal strength and in programming. Finally, board president Barbara Bozzuto conceded, Steiner and the board simply had different visions for the future of the station. This last explanation was the least controversial. Steiner’s focus on not just the problems of people on the social margins but on their perspectives represented a counter current in the public radio mainstream. Jack Mitchell identified this key distinction in Listener Supported, his 2005 history of NPR: Public radio was a service that was “focused on the societally conscious, not a service that was societally conscious.” Steiner, by contrast, didn’t just bring advocates for the city’s homeless into the studio; he brought the homeless in to speak for themselves. This approach proved lucrative. From 1997 to 2007, NPR’s annual revenue more than doubled to $179.2 million, most of it in the form of corporate underwriting and, indirectly, from increased listener donations to member stations. As early as 1985, Giovannoni was frank about the challenge this approach would pose to earlier conceptions of public radio’s mission: “Many will find the strategy of ‘premeditated elitism’ unacceptable.” Turning away from “the cheap 90” percent of listeners who didn’t contribute and toward the affluent and educated few who did, however, was the course of action he urged on member stations. By the late 2000s, NPR had constructed profiles for its most desired listener types, with euphemistically described “Voracious Voyagers, Team Captains, and Dutiful Aggregators,” different kinds of well-educated, high-income people newly described so as to sound less elitist but still attractive to corporate underwriters. Steiner has stated in interviews that he felt pressure at WYPR to tread lightly on stories that cast underwriters in a bad light or that criticized industries in which Brandon invested or had personal connections to. Predictably, Steiner didn’t take well to such pressure and by his own admission went out of his way to demonstrate his independence. In 2014, six years after Steiner left, station staff mounted a unionization bid, citing concerns over the blurred line between underwriting and programming at the station. The bid failed, but concerns continued to be raised about the relationship between underwriters and programming decisions. Brandon did not respond to a request for an interview for this article. A year after his firing, ratings for Steiner’s time slot, occupied by a public and cultural affairs program called Midday, were slightly higher than they had been in Steiner’s last year. Hosted by Baltimore Sun columnist Dan Rodricks, Midday was decidedly less edgy, featuring more “lifestyle” topics about food, dining, travel and gardening, aimed at the Voracious Voyagers and Team Captains. And while revenue was down, this could largely be attributed to the recession, which had affected other NPR member stations similarly. By then Steiner had settled into a new version of his show at WEAA, Morgan State University’s station. WEAA also carries Democracy Now, but its signature sound is “cool jazz.” To hear Steiner tell it, the show hasn’t changed all that much in spirit and mission; however, broadcasting from Morgan State University, the city’s largest historically black university, seemed to embolden Steiner to bring even more African-American voices and perspectives to the public airwaves. WEAA calls itself “The Voice of the Community,” and Steiner and his producers told me they took this slogan seriously. Steiner has had a series of guest hosts over the years — most of them African-American, many of them women — and his invited guest experts include more African-Americans than comparable programs on WYPR, including his former show. His show is one of those rare racial crossroads in the city and in public media. “I will miss his voice, intellect and support of all of us given the opportunity to share the airwaves with him,” Kimberly Moffitt, associate professor of American studies at the University of Maryland, Baltimore County, and a frequent guest and guest host told me. Fighting to bridge the racial divide was, in some ways, harder to do from a smaller station anchored at a historically black institution. Changes in institutional resources have also wrought changes in programming. Steiner’s audience was considerably smaller on WEAA than it had been at WYPR. In general, WEAA draws about half the audience that WYPR draws. The audience is less affluent as well, which meant less money for programming. The university gave Steiner only about $100,000 a year to cover production costs. Everything else would have to be raised by his production company, the Center for Emerging Media. And the years of constantly hustling to raise funds took its toll. “After a while, you lose your creative edge,” Steiner admitted. Fighting to bridge the racial divide was, in some ways, harder to do from a smaller station anchored at a historically black institution. Mavronis told me that she routinely encounters white Baltimoreans who had no idea Steiner was still on the air after his departure from WYPR — a sad echo of Steiner’s early observation about the racial segregation of the airwaves. Steiner’s public statement about leaving WEAA was cordial, even warm, referring to WEAA as “like family.” But in an interview a week after the announcement, Steiner described the parting as “bittersweet.” DeWayne Wickham, dean of Morgan State’s School of Global Journalism & Communication, let Steiner know that the school would no longer be supporting the show. The ostensible reason was that the move was part of a broader revamping of the station schedule to provide more opportunities for Morgan State students to use the station to report, produce and deliver news programming. Former Steiner Show producers were keen to point out the low cost to the university of most of the current schedule and the many opportunities for internships and employment the program offered current students and recent graduates. “We always find something for Morgan students,” insists Mavronis. “Our board operator is a Morgan grad. Most of the staff is former students.” So many of the hosts of the other regular programs are produced and hosted by unpaid volunteers who have been showing undergrads the ropes for years, she continued. Starting in August, Steiner will be running operations entirely out of the cramped offices and studio of the Center for Emerging Media, with Valerie Williams — the Center’s executive director and Steiner’s wife — and his small staff of producers. They are making the best of their new-found institutional freedom to pursue multimedia projects that look beyond Baltimore but that hew closely to critical social justice themes. One, tentatively titled The Alabama Chronicles, features interviews with Martin Luther King Jr.’s barber. Another project, in collaboration with Tavis Smiley, will focus on the work of political theorist Benjamin Barber. The center will also support the media productions of young people and “new voices” in Baltimore who need access to production space and expertise. Jason Loviglio is associate professor and founding chair of Media and Communication Studies at the University of Maryland, Baltimore County. He is author of Radio’s Intimate Public: Network Broadcasting and Mass-Mediated Democracy and co-editor, with Michele Hilmes, of Radio Reader: Essays in the Cultural History of Radio and Radio’s New Wave: Global Sound in the Digital Era. His work on the “public radio structure of feeling” has appeared in journal articles and is the focus of a book project in progress. Listeners are flooding the station with emails, posting angry comments and picketing the studios. Great story. I went to high school with Marc’s sister and got to know his whole family. Wonderful people.